1. 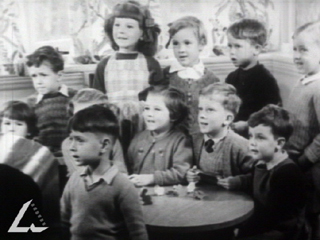 Students will learn about early educational TV programs in Australia and why they were seen as important. 2. Students will research current regulations pertaining to children’s television and what educational and entertainment options there are for children. 3. Students will learn to express their ideas through media forms and gain self-confidence and communication skills through that expression. VIC- VCE Media Studies: Units 1, 2 and 4. 1. Why do you think there was a need for a kindergarten or school that broadcast lessons etc around Australia? 2. Do you think there is still a need for this? If so, why? If not, how might we be tackling the communication problem now? a. How does children’s (primary age and under) television differ today from that of the clip? b. Compare your experience of children’s television with that of the clip and today’s shows. What are the main differences that you see? c.	Do you see any differences are between public broadcasters (ABC and SBS) and commercial broadcasters? Why might that be? d.	And if your school has the equipment, shoot and edit the show. Read Media 1 by Roger Dunscombe, Melinda Anastasios- Roberts, Juliet Francis, Karen Koch, George Lekatsas and Nick Ouchtomsky and Media 2 by Roger Dunscombe, Melinda Anastasios-Roberts, Kevin Tibaldi and Andrew Hyde. Heinemann Harcourt Education, Port Melbourne, 2007. Two recommended texts for classroom use for discussing media codes and conventions and video production as well as many other key media concepts that relate to this clip. Go to the books online at Heinemann Media for more detail. Read _ Nelson Media VCE Units 1— 4_ by Jo Flack. Thomson Learning. Australia, 2005.